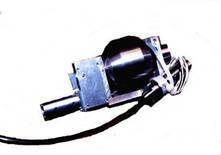 We have developed a range of state of the art small underwater brushless gear motors, actuators and resolvers designed specifically to meet pressure, underwater, radiation and other extreme environment conditions. Years of experience have resulted in a superior line capable of reliable performance in the most extreme environments. Primarily using brushless servo technology in small, extreme environment packages makes this product line unique in the industry. By analyzing the challenges of each environment, the trouble spots in the mechanics, the nature of the risks, and the relevant technologies, Engineering By Design applies advanced engineering, research, and experience to bear on the challenge. These Extreme Environment motors have been used by major companies in a variety of applications . Check out some of these applications shown below. 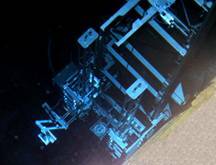 The design of this robot used t o scan an Access Hole Cover located 80 feet underwater. The scanner moves a transducer package (7 transducers) around the circumference of the access hole cover while moving the transducers in and out radially. Used in the Nuclear Power Industry for deep water examinations. Can also be used to remotely examine covers or plate material in a hazardous environment. This Remote Robot was used to perform ultrasonic examination of a “T” connection in a piping system. The weld that attaches the cap to the “T” was ultrasonically examined with this robot. This robot was used in a high radiation area in the core of a nuclear reactor. The piping system was 60 feet underwater. This robot can be used where human protection is required. Sealed motors for underwater operation. Clamping mechanism holds 200 lb robot securely in place. Able to position search units along the weld accurate to within .05 “. This machine remotely inserts stabilizers between the rods of a nuclear fuel bundle. The fuel bundles can then be safely moved to a shipping container. This was a first-of-a-kind project. A combination of state and local officials, multiple power utilities and power plant service providers worked as a team in the transportation of nuclear fuel from one power plant to one located in a different state. Specially designed stabilizers were inserted between fuel rods 40 feet under water. This is a Remote underwater scanner that attaches to flat or curved surfaces via suction cup feet. Used to deliver an ultrasonic or process head to an extreme or hazardous environment area such as nuclear reactor components, oil platforms or deep water applications. The versatility of the delivery mechanism allows for other remote operations to occur with the same scanner. Other operations may include grinding, cutting, welding, boat samples, Ultrasonic or Eddy Current examination. Azimuth sensor determines the scanner position in degrees or distance from reference zero location. The suction cup feet are able to hold tool weights of up to 200 lbs. Three axis robotic process head delivery tools surface location. Either tool can be used for welding, weld removal, grinding or a customer specific application. Depending on application, modifications may be necessary. Withstood over 1000 hours of underwater operation in a high radiation environment (inside a reactor core). Due to the tools’ small cross section they can be remotely installed through the top guide. PLC controls with a touch-sensitive Graphical User Interface for ease of programming scan plans. PC based data acquisition system used to record operational parameters. Radiation tolerant Charged-Coupled Device (CCD) cameras shielded by a specially designed tungsten housing. 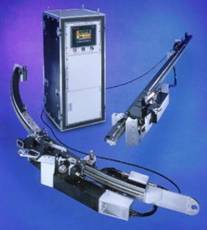 Performs visual inspection in high radiation areas or mounts to tooling to monitor machine activities. May be used underwater up to depths of 100 feet. Specially designed tungsten housing to shield circuitry. Radiation hardened glass used to increase lens longevity. A ten axis robot (five axes per side) featuring fully remote PC control and state-of-the-art Graphical User Interface (GUI). Originally designed for weld contouring and blending weld metal and base material. With some modifications, can be used for welding, cutting, painting and/or weld removal. Complex mathematical formulas used to coordinate axes and establish cutting planes. Extremely accurate positioning feedback for all axes allows for precise operation in pre-programmed paths or for manual operation in localized areas. As you can see our motors are put to the test. Put them to your test. Just ask! !